This time of year, I start craving oysters. I’m not sure if it’s some latent seasonal foraging instinct, or simply a long time since we’ve had ’em, but I have oysters on the brain. Saturday, I finished up some farm chores, jumped off the tractor by early afternoon, rounded up the kids and hit the beach. 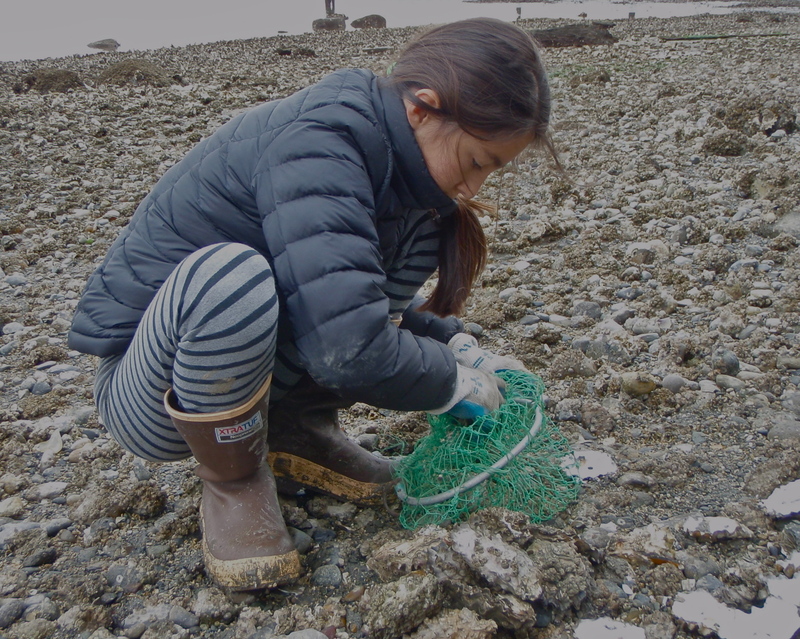 With the Skyla (above, counting out her harvest) and Weston gathering, and me shucking, we finished our limits quickly then got to work making mini-aquariums out of tupperware bowls. Rock pricklebacks, limpets, shore crabs and the prize of the day, a baby sunflower star, filled the bowls and made it hard to leave the beach. The kids have been doing this since they were tiny, and yet, watching small seashore critters continues to draw a powerful interest from both of them. And, I admit, me, too. But we were getting hungry, so we released our captives, and headed home. Back in the kitchen, Skyla helped accelerate the breading process (flour, egg wash, panko) and kept us ahead of the game on turning each oyster in the pan as it turned golden brown. What a meal. A little brown and wild rice, some fresh asparagus spears, and big piles of crispy, briny oysters. Skyla ate nine, Weston gave her a run for her money with seven, Stacy ate a dozen, and well, I don’t even want to say how many I ate, other than that it was at least double anyone else’s count. And now I’m ready for more.